When you’re in a hospital or healthcare facility, the last thing you want to worry about is seating. Not to mention the fact that seating is always limited and can take up a lot of space. The anti-microbial folding flex spring seats are designed specifically for healthcare environments with limited space such as exam rooms, hospital corridors, and patient rooms. The folding flex spring seats are unique in their ability to fold up into a profile of less than five inches when not in use and can support up to 600 pounds. The seats can be mounted to the wall or floor or can come with fixed or movable bases to best suit your specific needs. There are no hinges or hardware, making them easy to install and maintenance-free. Antimicrobial product protection ensures that your seating stays clean and safe. Multiple finishes, textiles, surfaces, and paint options are available to ensure that the flex spring seats integrate seamlessly into your existing environment. Flex spring seats with fixed or movable bases are ideal for applications that require both flexible and compact seating. The seats sit at a compact and comfortable pitch available with fixed or movable bases. The fixed bases feature 22” minimum center-to-center seat spacing that makes them ideal for reception areas. The award-winning wall mounted flex spring seats utilize and innovative folding mechanism that allows the seat to cantilever off the wall. 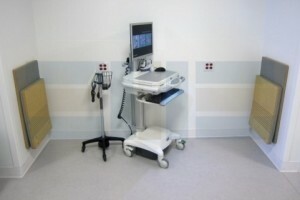 The chair is mounted 6” off the floor to facilitate easy cleaning and its slim profile maximizes space for corridors, patient rooms, waiting rooms, and more. The floor mounted seats combine the features of the original seats with the space-saving benefit of the wall mounted seats. 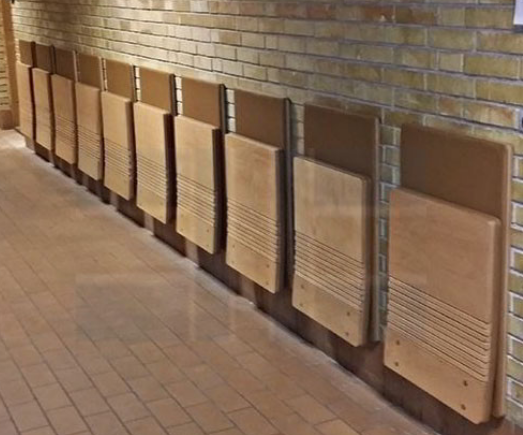 These chairs are mounted to the floor and flush to the wall, sitting at a pitch of 90 degrees. 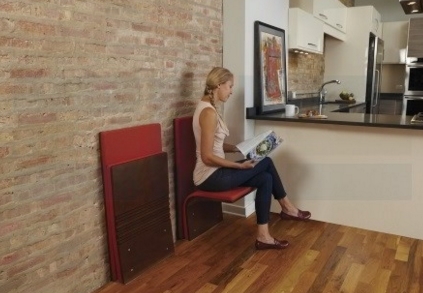 They are ideal for seating in narrow corridors. 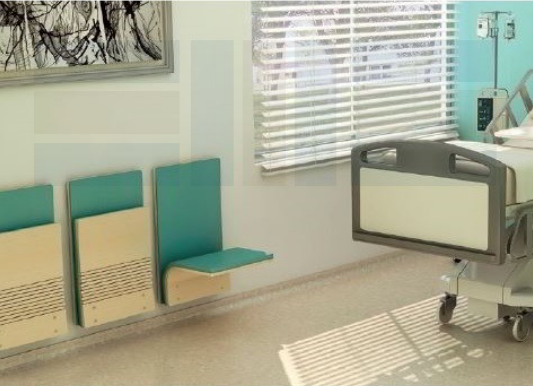 Any of these seating solutions would be ideal for hospitals and other healthcare facilities, and all are available to buy online. If you want assistance deciding which type of flex spring seat would be right for you or if you have any additional questions, give us a call at 1-855-786-7667.